Researchers warn that the surge in global tourism is outstripping the "decarbonization" of tourism-related technology. In the first study of its kind, researchers found that carbon emissions from world travel contribute about 8 percent of all carbon emissions, four times more than previously estimated. That rate is expected to grow 4 percent annually, outpacing the footprints of many other economic sectors, according to the study published Monday in the journal Nature Climate Change. The study takes a sweeping look at the environmental impact of global tourism by examining the entire supply chain, from flights, dining, to shopping purchases. High-income countries account for the majority of this footprint, with the U.S. topping the list followed by China, Germany and India. "Our analysis is a world-first look at the true cost of tourism -- including consumables such as food from eating out and souvenirs -- it's a complete life-cycle assessment of global tourism, ensuring we don't miss any impacts," said senior author Arunima Malik, who teaches sustainability at the University of Sydney. The study, which did not distinguish between business travel and tourism, found that domestic travel accounts for the majority of these carbon footprints. Transportation, shopping and food were cited as significant contributors to tourism-generated emissions. The findings suggest a natural tension between efforts to slow global warming and spending that drives many local and even national economies. 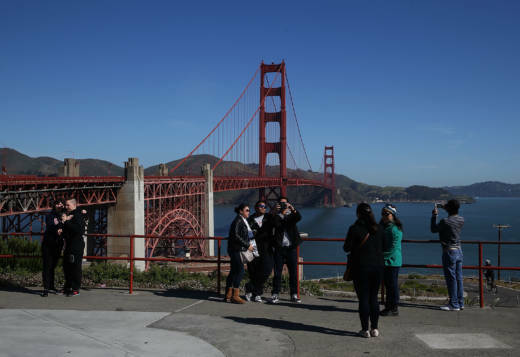 San Francisco had a total of 24.6 million visitors in 2015, an increase of 2.7 percent over 2014, according to the San Francisco Travel Association. Visitors spent $8.5 billion in the city while meeting planners and exhibitors for "goods and services" shelled out another $723 million. In some smaller nations such as the Maldives, Mauritius, Cyrus and the Seychelles, international tourism accounted for 30 to 80 percent of all national emissions. Given the growing environmental impact of world travel, the study authors say that international climate talks should include tourism-generated emissions in the agenda. "Carbon taxes or carbon trading schemes -- in particular for aviation -- may be required to curtail unchecked future growth in tourism-related emissions."